Have you seen this fabric? Thread: Have you seen this fabric? Has anyone seen this fabric (black background)? 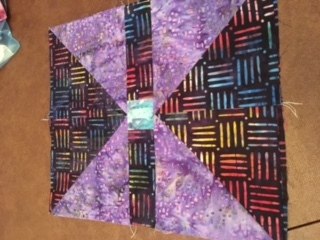 I mis-measured one 6.25" square and it is the last of 54 batik fabrics in my quilt. I bought most the fabric on a recent trip to HI, but a few came from FL. As you can guess, I was in many, many quilt shops in the past few months and while traveling. If you have seen it in your travels, please let me know. Thank you! No, but it's really cool looking. I'm sure you already thought to look on the salvage for make and collection info. Google it and it may tell you who still has some. I found some Christmas fabric that way. It looks familiar but I can't get to my sewing room due to neuropathy in my legs. I can't walk or do stairs. Try Hancock's of Paducah. I have seen it in their catalog. What areas of FL were you in? If you know the shops, call them and send a picture of the fabric. Our local shop does look-ups with a phone picture often for our members. I love one of the local shops that shows the name and item number of fabrics on my receipt. Easy to save them for reference in case I need more fabric later. Sorry .... hope you find it .